I'll be honest with you. I had my doubts about the coat of arms on this next memorial. It turns out, my skepticism was unfounded. Still, it's not the usual heraldry that one expects to see. As fuch his Death was Lamented. It was, of course, the coat of arms above the topmost of the three cherub's heads that caused me some doubt. The History of the Parish Church of Saint Margaret, Westminster by Walcott (1847) blazons the arms as: Argent two swords hilted or bendy dexter and sinister piercing a heart gules in chief a mullet for distinction sable. However, if you look closely (you can click on the picture above to see a larger photograph), the sword blades appear to azure, and the charge in chief is pretty clearly a cinquefoil and not a mullet. Burke's General Armory cites something closer in the arms of Pearson* (Kippenross, co. Stirling). Argent two daggers in bend and bend sinister conjoined in point azure piercing a man's heart in base proper in the honour point a cinquefoil sable. So, an unusual coat of arms, but a real (albeit rare) one. But this sort of thing is one of the reasons I truly enjoy studying and researching heraldry. You can always learn something new. The History of the Parish Church of Saint Margaret, Westminster by Walcott (1847) does not mention the coat of arms and crest, nor do I find the arms described in any of the other guidebooks, so I have no idea of the colors. Burke's General Armory has a citation for Wilson (West Wickham, co. Kent; confirmed at Edinburgh, 20 July 1762). Argent on a chevron between three mullets gules a crescent argent. Crest: A talbot’s head erased proper. That would appear to be a differenced version of the arms here. The arms on the memorial could be the paternal coat of arms, Argent a chevron between three mullets gules, as several Wilson families shown in Burke have minor differences (bordure, charge on chevron, etc.). It is hard for me to tell whether the crest is a talbot's head or a bear's head. In either event, the head does not appear to be erased, but it is possible that could be an error by the carver. As a possible identification for the wife’s arms, Papworth's Ordinary of British Armorials assigns Argent a lion passant on a chief sable three mullets argent to Ball, co. Northampton, granted 1613. But with no tinctures, and no biographical information being found in any of my on-line searches, it is difficult to feel any real certainty about this identification. In any event, it is a touching monument from a couple who lost two of their children, and it is also a beautiful piece of heraldic carving. Note the care taken to show the mantling on the side of the helmet. A large raised Alabaster Tomb, with the recumbent coloured figure of a Lady. The tomb is that of Mary (or Marie), Lady Dudley, daughter of William Howard, first Baron Howard of Effingham, Lord High Admiral of England (the ninth son of Thomas Howard, second Duke of Norfolk); and sister of Charles Howard of Effingham, Earl of Nottingham, Lord High Admiral. She married, first, Edward Sutton, Lord Dudley, and second, Richard Montpesson, Esq. She died on August 21, 1600. There are two shields with visible painted charges on them. The large one at the top is her paternal arms, the well-known arms of Howard, blazoned: Quarterly: 1, Gules a bend between six crosses crosslet fitchy argent (Howard); 2, Gules three lions passant gardant in pale or in chief a label of three tags argent (Brotherton); 3, Checky or and azure (Warren); and 4, Gules a lion rampant argent armed and langued gules (Mowbray). Underneath the mantle are two shields. The one on the right contains no discernible figures that I could make out, but it is probably meant for the arms of her first husband, Edward Sutton, Baron Dudley, Or a lion rampant double-queued vert. The shield on the left is the arms of her second husband, Richard Montpesson: Quarterly: 1 and 6, Argent a lion rampant sable (Montpesson); 2, Gules a chevron ermine between three leopard's faces or; 3, Argent a lion passant gules; 4, Azure a fess between three fleurs-de-lys or; and 5, Argent a tower and in chief three roundels sable. I have been unable to find much information about Richard Montpesson beyond his marriage to the widowed Lady Dudley, and even less about his coat of arms, which do not appear in Burke's General Armory or in Rietstap's Armorial Général. Still, this monument really is all about her, and it truly is a testament to her life. Though uncolored here, the arms are blazoned in The History of the Parish Church of Saint Margaret, Westminster by Walcott (1847) as Sable three bugle horns argent stringed gules. There is no entry for Dorington in Burke’s General Armory. 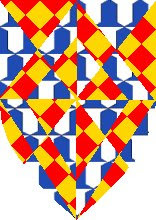 Burke gives the same attribution for these arms, but gives the crest as A lion’s jambe proper holding a flag gules charged with a chevron or. Fairbairn’s Crests gives that crest cited in Burke as belonging to Dorington and Dorrington, as well as to Dodington. No sources give the crest as it appears on the monument, which I take to be A stag’s or hart’s (or possibly an elk’s) head erased. According to Burke’s Landed Gentry, John Edward Dorington, Esq., of Lypiatt Park (b. 1832), was the son of John Edward Dorington, Esq., of Lypiatt Park (d. 1874), and the grandson of John Dorington (d. 1827) and his wife Sarah Columbine (d. 1845), who are memorialized here. The Landed Gentry gives the arms of Dorington of Lypiatt Park as Sable three bugles argent stringed gules, with the motto Strepitus non terret ovantem (for which I find no entry in Fairbairn’s, and so no translation, except for a somewhat opaque one from one of the Latin-to-English on-line translators, which results in “Noise that scares mounting”). Many are the incidents, but faintly written in the pages of history, which would have remained for ever dark and illegible, but for the light flashed on them by the torch of Heraldry. A shield of Arms, a Badge, or a Rebus depicted on a glass window, painted on a wall, carved on a corbel or monument, will frequently indicate, with unerring precision, the date to which such relics are to be ascribed, and whose memory they are intended to perpetuate, when all verbal descriptions are wanting; and the identity of many an old portrait rests on no other authority than that of a coat of Arms painted at the side. For the pursuit of family history, of topographical and territorial learning, of ecclesiology, of architecture, it is altogether indispensable; and its total and contemptuous neglect in this country [Scotland], is one of the causes why a Scotchman can rarely speak or write on any of these subjects without being exposed to the charge of using a language he does not understand. Heraldry is incredibly important with silver. Hallmarks tell you who made the object, where it was made and when it was made, but the coat of arms will tell you for whom it was made. It’s the final cherry on the cake that leads you to the full story. I love the sentiment contained in that final sentence, don't you? There are a few games around that involve heraldry. Sometimes a "game" can be a task that a few bored heralds may assign to themselves. I was involved with one of these, where six of us, having been left pretty much unsupervised, tried to create a coat of arms consisting of a field and a single standard heraldic charge that everyone who saw it would say was "too complex." The blazon is: Gyronny [of eight] lozengy gules and or, and vair, a mascle throughout counterchanged. All the players are organized into a list, and the first person in the list is given a coat of arms that they need to blazon. They send their blazon to the second person in the list, who proceeds to draw a coat of arms using only that blazon. They then send their coat of arms to the next person in sequence and this continues until the final player and all the coats of arms and blazons are revealed! What an interesting idea for the next time you're sitting around with some other heraldry enthusiasts and want a fun way to pass the time. This next memorial in St. Margaret's Chapel, Westminster, is another old one, memorializing the death of a man in 1640, as well as two of his children, Richard and Elionor, and Richard's wife Elizabeth. There's a lot of text on that plaque, not all of which came out entirely legible on either of the two photographs I took of it. (You can click on the image above to see the clearer of the two large pictures of the memorial.) In brief, it is a memorial to Richard Willis, Esq., who died June 21st, 1640 at the Starchamber in Westminster. His wife, Eleanor White, by whom he had eight children, was still living at that time. His son Richard erected this monument. The text then goes on to mention the other family members who are buried nearby. But, of course, it was the coat of arms at the top of the memorial which caught my eye. As painted, I would blazon the arms: Quarterly: 1 and 4, Argent three griffins passant in pale sable within a bordure engrailed gules bezanty; 2 and 3, Azure a wolf salient argent langued gules; overall at the fess point a crescent argent for difference. The crest atop the wreath (which ought by right to be argent and sable, not or and azure) is: A demi-griffin sable holding in its talons a poleaxe proper headed (azure?). The History of the Parish Church of Saint Margaret, Westminster by Walcott, 1847, gives the field in the second and third quarters as sable, and makes the battle axe fully sable like the demi-griffin. So there may be some mis-painted tinctures here. The real trouble, though, is that I cannot find this coat of arms anywhere. It appears to be a bit of a mashup, and the sort of thing that one might expect to find being sold as "your family crest" by some heraldic bucket shop. The arms in the first and fourth quarters are similar to - and different from - these two entries in Burke's General Armory for Wills (no second "i"): Argent three wyverns passant in pale a bordure engrailed sable bezanty (Wills, Landarke, county Cornwall), and Argent three griffins passant in pale azure murally gorged argent a border sable bezanty (Sir Charles Wills, K.B., died 1741). The crests are, respectively: A demi-griffin azure wings addorssed holding with both claws a battle axe proper, and A demi-griffin segreant azure murally gorged or sustaining a battle axe proper. The arms in the second and third quarters may be Downe: Azure a wolf salient langued and armed gules. If the field is truly supposed to be sable, though, the closest match in Papworth's Ordinary of British Armorials is Loude/Louthe/Lowte: Sable a wolf salient and in dexter chief a crescent for difference argent. As I said, similar but different, both the arms and the crests. The name on the memorial is quite clearly Willis, and is given as Willis in Walcott's book as well. Yet the arms appear to be a variant of Wills. In which respect it were fit that common Painters, the common disorderers of these tokens of honour, were better looked unto; who both in former ages, and much more in these daies, have greatly corrupted these honourable signs, by adding their new fantasticall inventions; that so they might make the things borne in Coat-Armour more perspicuous to the view, or because they would be thought to be well overseen in Heraldry. For indeed they want the eye of judgment, to see and discerne that such is the excellency of these honourable tokens, that the least alteration either by augmentation, diminution, transposition, or whatsoever other means, doth occasion a change in them so great, as that they thereby differ from themselves, not onely in their accidentall, but also in their substantiall parts, and cease to be any longer the same they were before, and their owners are debarred to challenge an propriety or interest in them, in respect of such alteration. Modica alteratio in membro principali magnam alterationem facit (saith the Philosopher) A little alteration makes a great alteration in a principall part. As the least spot in the Eye, which is the worthiest part of the face, doth more disfigure the same, than ten times so much in any other member of the whole body. [E]very coach, house, and sign painter pretends to a knowledge of the science of heraldry, rather than lose the job when offered. I don't know that the coat of arms for this family memorial is a result of a bucket shop herald, but given the other evidence, I cannot say that it isn't. Our next armorial memorial is a charming one to a young man who was taken in what some would call "the bloom of life." Hopes to enjoy eternal Peace and Love. Once again, as usual, I noticed the shield first, and the rest of the monument after. Burke's General Armory gives these as the arms of Arnold (Gloucestershire, granted 1653): Gules a chevron ermine between three pheons or. Still, it's a very sweet memorial by a loving sister to her brother, in addition to displaying some remarkably simple heraldry.